In late December 1978, a United Airlines commercial aircraft DC-8 carrying 181 passengers and 8 crew crashed outside Portland, Oregon. 8 passengers and 2 crew members died. Although the crew did encounter a real malfunction of the aircraft, ultimately the National Transportation and Safety Board (NTSB) investigation concluded it was the crew’s carelessness and inability to work together effectively that led to a preventable exhaustion of all fuel causing all 4 engines to flame out. The crew’s responsibility for the crash was seen as a common theme arising in several other recent (at the time) aviation mishaps- i.e. the inability for crews to work and communicate with one another effectively. Therefore, this crash directly led to multiple airline companies adopting new training for all crews beginning in 1981, which has evolved to become what aircrew know today as Crew Resource Management (CRM). “About 1815 Pacific standard time on December 28, 1978, United Airlines, Inc., Flight 173 crashed into a wooded, populated area of suburban Portland, Oregon, during an approach to the Portland International Airport. The aircraft had delayed southeast of the airport at a low altitude for about 1 hour while the flightcrew coped with a landing gear malfunction and prepared the passengers for the possibility of a landing gear failure upon landing. The plane crashed about 6 nmi southeast of the airport. The aircraft was destroyed; there was no fire. Of the 181 passengers and 8 crewmembers aboard, 8 passengers, the flight engineer, and a flight attendant were killed and 21 passengers and 2 crewmembers were injured seriously. The National Transportation Safety Board determined that the probable cause of the accident was the failure of the captain to monitor properly the aircraft’s fuel state and to properly respond to the low fuel state and the crewmember’s advisories regarding fuel state. This resulted in fuel exhaustion to all engines. His inattention resulted from preoccupation with a landing gear malfunction and preparations for a possible landing emergency. 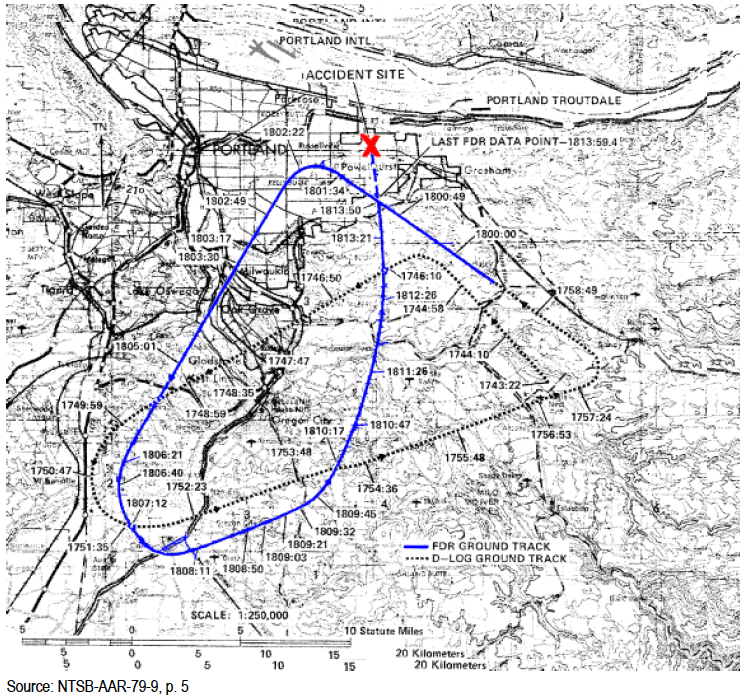 Although the pilot’s abilities to land the DC-8 in a populated suburban area with minimal loss of life should be lauded, the unfortunate event could have almost certainly been avoided if the pilot-in-command and his crew had worked together more effectively. After the landing gear malfunction, the crew held in a pattern south of Portland for 1 hour and 2 minutes. Their fuel quantities were known throughout the series of events and the time and distance able to be traveled with diminishing fuel was predictable. Concerns for fuel levels were even voiced by several members of the crew throughout the time United 173 was holding. Ultimately, the captain’s isolated attention to the gear malfunction eclipsed the more serious concern of fuel quantities. By the time this was realized, reaching Portland International had become an impossibility. At 1809:21, the captain advised Portland Approach, “United, seven three is going to turn toward the airport and come on in.” After confirming Flight 173’s intentions, Portland Approach cleared the flight for the visual approach to runway 281. At 1810:17, the captain requested that the flight engineer “reset that circuit breaker momentarily. See if we get gear lights.” The flight engineer complied with the request. At 1810:47, the captain requested the flight’s distance from the airport. Portland approach responded, “I’d call it eighteen flying miles.” At 1812:42, the captain made another request for distance. Portland Approach responded, “Twelve flying miles.” The flight was then cleared to contact Portland tower. At 1813:46, the captain told the first officer, “Okay. Declare a mayday.” At 1813:50, the first officer called Portland International Airport tower and declared, “Portland tower, United one seventy three heavy, Mayday. We’re–the engines are flaming out. ,We’re going down. We’re not going to be able to make the airport.” This was the last radio transmission from Flight 173. “The National Transportation Safety Board determined that the probable cause of the accident was the failure of the captain to monitor properly the aircraft’s fuel state and to properly respond to the low fuel state and the crew-member’s advisories regarding fuel state. This resulted in fuel exhaustion to all engine‘s. His inattention resulted from preoccupation with a landing gear malfunction and preparations for a possible landing emergency. The NTSB recognized that some of the fuel quantity gauges were in fact difficult to read and interpret. For this reason, they recommended that additional training and a bulletin of this issue be released to all aircrew operating on the DC-8. Initially identified as Flightdeck Resource Management, this concept quickly evolved to Cockpit Resource Management. In time, even this term was replaced by the term used today – Crew Resource Management (aka CRM). CRM training is offered by both transportation organizations and private industry consultant companies. CRM was first adopted (not surprisingly) by United Airlines in 1981 and is now a mandatory part of crew training for most major airlines, NASA and military aviation. Concepts similar to CRM have been developed for other Highly Reliable Organizations such as nuclear and medicine. Medicine can benefit a great deal from the concepts of CRM, especially in the ED, the OR, and the trauma bay where the ER doc or surgeon may assume a dictatorial pose, preventing the team from sharing critical information effectively. One example of CRM-like training modified for medicine is known as TeamSTEPPS. The Agency for Healthcare Research and Quality (AHRQ) and the Defense Department have teamed to build a national training and support network calling for the National Implementation of TeamSTEPPS. 1. Original NTSB Safety Investigation. 7 June 1979.